Our preview of free agency continues today with those teams who should go into free agency and hold steady, even if that’s not what they actually end up doing. Of the four groups of teams that make up this free agent preview, this is the closest one to a “Leftovers” set, but there’s no shame in that; you can’t hit the free agent market hard every year, and some of these teams enjoy annual success without pounding the pavement in March. unless there’s a superstar that might fit the bill. Others will need to spend more time focusing on retaining their own free agents, and then a few need to just stay out of free agency for their own good. In all, this group should spend less money on new veteran free agents than the rest of the league, but we’ve tried to lay out scenarios where they could delve into the market to fill a hole or two. On Monday, we start with the spenders. Remember the legendary 2008 draft class that started Thomas Dimitroff’s reign in Atlanta? It’s hitting free agency this year, and it’s not quite as hot as it once seemed to be. Matt Ryan has yet to win a playoff game, and while Thomas DeCoud has emerged as an above-average safety, the only other starter left from the group is Curtis Lofton, the team’s run-thumping middle linebacker. After the Falcons slapped the franchise tag on cornerback Brent Grimes, Lofton became the team’s top priority. Arguably the team’s top defender, Lofton made a full 15 percent of the team’s tackles on defense, the fifth-highest rate in the league. (D’Qwell Jackson was first, at an even 17 percent.) Atlanta could try to move Sean Weatherspoon into the middle or go after someone like Stephen Tulloch as a Lofton replacement, but he belongs in a class with David Harris as one of the best run-stopping young linebackers in football. To some extent, it’s not smart for the Bills to get involved in free agency. Right or wrong, Buffalo is viewed around the league as a dormant franchise and city, which means that they have to overpay to bring in anything resembling a marquee free agent. You might remember the Bills bringing in Terrell Owens in 2009; he got $6.5 million in guaranteed money for a one-year deal, which was far more than he could have gotten elsewhere. Their last prominent free agent before that was guard Derrick Dockery, who got $18 million in guaranteed money and lasted two years in upstate New York. The process hasn’t worked for them. The other strategy would be to lock up their above-average or better players before they have a chance to hit free agency, where they could presumably get players who already realize the charms of Buffalo living to stay home at the prevailing market rates. They’ve already done that with Stevie Johnson, but they might also consider deals for offensive lineman Andy Levitre, slot corner/returner Leodis McKelvin, and even 31-year-old running back Fred Jackson, who has just 817 professional carries and might actually play younger than his age would indicate. If the Bills do go out onto the market, they should go down swinging. There’s no point in giving big deals to the middle tier; since they’re in need of a pass rusher, maybe they’re the team that goes out and dares Mario Williams to take $40 million guaranteed to come play in Buffalo. It’s ironic that an organization that might have made two of the best free agent signings in league history (Reggie White and Charles Woodson) has basically disavowed acquiring veterans in free agency. The last starter the Packers brought in as an unrestricted free agent was Brandon Chillar, who got all of $5.2 million to sign with the team. (Tramon Williams was signed after he was cut by the Texans, but that was straight out of training camp when Williams was an undrafted free agent.) Of course, the Packers have opted out of free agency for a good reason; general manager Ted Thompson is so effective at drafting and developing talent that the team simply doesn’t have very many holes on its roster to fill. This year might be a rare exception to that rule, but Green Bay won’t go flying into the market for a variety of starters. They have a hole at center, where Scott Wells is an unrestricted free agent, and they could use a viable pass rusher across from Clay Matthews. In a deep year for centers, Thompson could make a foray into the marketplace and come out with someone like Samson Satele or Todd McClure, even if it’s as a short-term stopgap while the team identifies its center of the future. They’re more likely to go after a pass rusher in the draft. With Matt Flynn departing, the Packers could also look for a veteran backup at quarterback to provide more depth behind the rambunctious Aaron Rodgers. If Rodgers were to go down with an injury, the Packers’ starter would be former Texas Tech star Graham Harrell. Oh boy. Then again, that’s what we used to say about Flynn, too. The Arian Foster signing may not have been the optimal way for Houston to spend its money, but what’s done is done, and the Texans need to act accordingly. Houston fans are currently playing with abacuses and building spreadsheets in an attempt to find a way for the Texans to retain Mario Williams, but at this point, it just doesn’t make sense for them to do so. 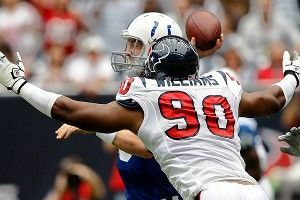 Locking up Williams will put Houston into cap hell, and with Matt Schaub’s contract about to come due in 2013, they’re better off putting the savings into a new deal for Schaub and extensions for guard Mike Brisiel and center Chris Myers. And while we still think the Texans should have held on to Williams, they can survive without him. Outside linebackers Brooks Reed and Connor Barwin should be able to pick up the slack (as they did when Williams missed most of 2011), and if they cut Kevin Walter, they could go after somebody like Robert Meachem to play across from Andre Johnson at wideout. Either way, the Texans should be fine; they’re the only above-average team in the weakest division in football, and they’re the huge favorites to win the AFC South again in 2012. The Vikings, meanwhile, are the cellar-dwellers in what might be the toughest division in the league, the NFC North, and they really don’t have a lot to look forward to in 2012. The jury’s still out on Christian Ponder, Adrian Peterson’s still recovering from his torn ACL and MCL, and while their 2-9 record in games decided by one touchdown or less suggests that they should be better next year, that bounce probably won’t be enough to push them into anything resembling contention. With that in mind, the Vikings should take free agency off this year and save their money for 2013. At that point, they’ll have a better idea of what they’ve got with Ponder, a healthy Peterson, and two years of high draft picks to replenish their barren roster. If they do go after veteran free agents, they should try to target low-risk, high-upside players coming off of injuries or out of situations where they were backing up well-known veterans. Like who, you ask? Maybe they try to fill their hole at wideout by going after Josh Morgan or Chaz Schilens, young players who have performed well when they’ve been healthy. At cornerback, they could consider former Giants starter Terrell Thomas, who should be close to 100 percent after tearing his ACL last August, or Super Bowl hero Tracy Porter, who limped through the 2011 campaign with a variety of injuries. Regardless of who they get, any shopping plan for the Vikings should focus on young, talented players who can contribute to a winning Minnesota team in 2013 and beyond. Is there a better fit between player and team this offseason than Mike Wallace and the Patriots? New England’s passing offense is already very good, sure, but their inability to stretch the field without a healthy Rob Gronkowski cost them in the Super Bowl. Gronkowski’s ankle will be fine come 2012, but he only fell to the second round of the 2010 draft because of his injury woes in college, so counting on him to always be healthy is dangerous. Wallace is a vertical threat beyond compare, and at just 25, the Patriots would be getting him for the prime of his career. It would cost a first-round pick, but the Patriots have an extra first-rounder thanks to the Mark Ingram trade with the Saints last year, so that wouldn’t be an enormous hindrance. The Patriots would also be taking a key player away from their perennial rivals at the top of the AFC. Honestly, if you’re a Patriots fan and you’re not picketing on Route 1 for this to happen, you’re not doing your job. If the Wallace trade doesn’t happen, New England will probably sit free agency out. Observers have mooted a move for Mario Williams, which would fit Bill Belichick’s game plan of only targeting versatile, high-end veterans in free agency, but did the moves for Rosevelt Colvin or Adalius Thomas really work out as planned? The Pats played more 4-3 last year than they ever have under Belichick, but you have to figure that the 3-4 guru wants to eventually get back to his scheme of choice, and Williams’s experience in the 3-4 consists of five games last year. The Patriots will instead lock up Wes Welker and add veterans to serve as utility players in their front seven. They could also choose to re-sign either Mark Anderson or Andre Carter, who each had 10 sacks last year, but will probably struggle to bring them both back. After all the hype last year, the Eagles failed because their play at the line of scrimmage wasn’t up to snuff. In particular, Philadelphia’s offensive line was a patchwork group that never played a single down as the five-man unit the organization expected to use throughout the season. Repairing that line should make Michael Vick healthier, DeSean Jackson more effective, and that dismal goal-line performance a thing of the past. Although the team endlessly shuffled players around on the line last year, four of the team’s five spots are set. The only hole they need to fill is at left guard, and by coincidence, the best lineman in free agency just happens to play left guard: mammoth Saints Pro Bowler Carl Nicks, who appears set to leave the team after New Orleans failed to come to a long-term extension with Drew Brees and were forced to stick the franchise tag on him. Nicks will be expensive, but he’s the exact sort of brutal run-blocker the Eagles need. If Nicks is out of their price range, they could also go for Ravens guard Ben Grubbs, but they’re the only two guards on the market worth serious cash, so expect the bidding to be extensive. The team could also try to use Jackson’s down year to try to negotiate a long-term deal with their deep threat as part of a sell-low maneuver. They’re expected to trade or release Asante Samuel, which would clear out cap space for such a move. Vincent Jackson! Marcus McNeill! Luis Castillo! Kris Dielman! Nick Hardwick! The young talent that was supposed to be peaking in San Diego appears to be leaving town in droves, as the list above includes five starters who are 30 or younger and unlikely to return to San Diego. Dielman chose to retire, Castillo’s been released, and McNeill will be unable to pass a physical and should be cut over the weekend. The team could choose to retain Hardwick, but Jackson is likely to leave after the team spent years dragging their feet on a possible long-term deal. The problem is that there’s not a heck of a lot to replace them. General manager A.J. Smith will try to re-sign Jared Gaither as a replacement for McNeill, but Gaither is a question mark who both the Ravens and Chiefs gave away last year. The Chargers hope he’s a franchise left tackle and will have to pay to find out if he is. The organization hopes that 2011 third-rounder Vincent Brown can fill in for Jackson, but how is a 5-foot-11 guy going to play the same role as the 6-foot-5 Jackson? San Diego could shell out for Marques Colston in free agency, but why pay Colston — with a history of knee troubles — and not Jackson? They’ll also be in the running for all of the interior offensive linemen we’ve discussed in this article, especially if they can’t come to terms with Hardwick.